Discussion in 'Deck Help and Strategy' started by smacktack15, Mar 28, 2008. This card is the acceleration of the deck. You play this card down to power-up the right Pokemon at the right times. This card can also double as an attacker/staller/etc./etc. so don't feel worried of playing it down for some witty moves Togepi can also be helpful because it's "Find a Friend" attack can give you extra help (search your deck for any Pokemon and put it in your hand) but, is flippy. This is a very great "engine" Pokemon! It allows you Team Galactic Wager recovery for a win/win situation and can be used by itself for draw-power. Baltoy is also a very good card because it can get you out of sticky-situation. This Pokemon allows you to void out those pesky Lv.X's (Gardevoir Lv.X & Magmortar Lv.X come to mind ). It's attack is a great counter to Magmortar (Lv.X)/ any other Pokemon that requires energy or is weak to fire (or both) because with luck, you can discard up to 2 energy which pairs up with Energy Removal 2 perfectly! With a Lake Boundary in play, this can be a heavy hitter in the right cases. Feebas can get you some Pokemon too (just like Togepi) but, it costs one Water Energy. Rayquaza ex is a great recovery card because after a painful knock-out, you can easily slip on one-two Electric Energy on him for 30 to anyone, 50 to a Pokemon with a Poke-Power, or a flat-out 70!!!. This beast can be considered the main Pokemon in the deck. This is one heck of a card! This is the secret G&G counter that everyone overlooks !!! It has a nice Poke-Power that works wonders with Team Galactic's Wager because it lets you see if they have a yeaherz or oh-noz hand. It is played for it's main attack, Devo Crush. You send this up with or without a Lake Boundary and you can take out a Gardevoir Lv.X or Gallade by discarding two energy (You can get them back with a Night Maintenance). This is another all-out tech that especially kills Magmortar (Lv.X). Play this according to the situation. Crystal Beach: Play before a Scramble, Double Rainbow, and/or Boost Energy comes out. Windstorm: Play to discard annoying Pokemon Tools/Stadiums late game, let Pachirisu discard the Pokemon Tools earlier on. Steven's Advice: Perfect synergy between this and Claydol, what else can I say. 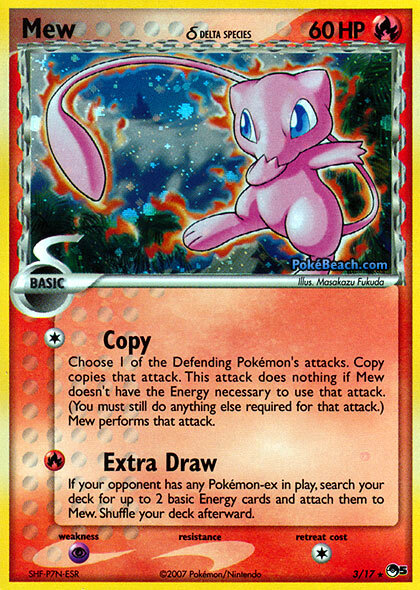 Energy Removal 2: Burn your opponents hard by using this and Milotic's Twister attack. Your opponent will be really fed up by all of their wasted energy. Super Scoop Up: Re-do Togekiss' Poke-Power again and again for a super-effect! Roseanne's Research: Can get specific energy and get more Pokemon, use wisely. Celio's Network: Get's you the Stage 1 & Stage 2 Pokemon you need. Only get Basic Pokemon in bad situations where you have no other options. Night Maintenance: Gets back energy into the deck for Togekiss to have better effects. Get back Pokemon if there are no signs of a Time-Space Distortion coming up soon. how have u done with this deck? Could You be more Specific about The strategy Please? Sorry but i dont like the deck, you have energy acceleration but nothing to actually get ko's to win games XD. Gardevoir Pk + Mew ex + Cres L.X I am sure can be deadly. Devo crush a maggy x and bring them to a magmar with 20 hp. maybe drop a Phoebe's or a 1-1 Jynx DF to bring the retreat cost to 0, switch it and take 2 prizes. If they have something to get that evo back you can look in the hand, if they do Wager it back and use maybe a 1-1 claydol to get that win/win situation. I have to give you props for that idea. I say if you think this deck is so great then prove me wrong but I still suggest you explore that Mew Ex. I like the deck zach, very creative!! What happened to the Lickilicki deck you were going to build?